I'm trying to add an extension mechanism to nodes, i.e. a sandbox solution node will be extending another node and all of the extended node's properties are copied to the extending node through a reference defined in the structure. However, when I change one of the copied properties, the actual one is also changed. How can I avoid this? So, above is a very very basic sketch of the problem, when B's name is changed, A's name is also changed. I think there needs to be an encapsulation to avoid modifications. I'm afraid you are not copying the properties, but instead reusing the A's properties through the reference. I made a mistake for using the word "copy". I know I'm reusing it, and I want to do so, what I want to do is: whenever A is changed B should change as well without any modification. But if a reused property in B is modified, it shouldn't be affecting A's property. I can't see a mechanism that could do this automatically for you. Maybe a concrete use-case that motivated you could help me envision a solution. 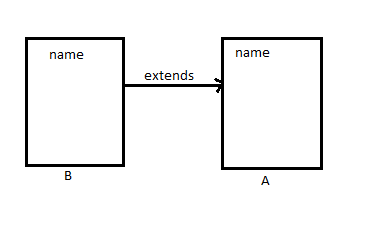 The closest parallel I found is the extension mechanism for classes in BaseLanguage - a class B can extend a class A and so inherit its "members". You explicitly "override" the "members" of the parent. The "members" are, however, children of the ClassConcept concept, not properties, so you can refer to them directly from the overriding "members". Perhaps something along these lines could be used for your case. If I understand correctly, you would like to have copy-on-write for properties. I could think of this solution, although it seems quite bizarre. Hope this helps. But it would be nice to know what your use-case is.